Wherever there are tourists, there are hotels, and this is certainly the case in Ho Chi Minh City, however, the quality and service in each hotel can vary greatly, depending on location, and of course, money. Recently opened, the nine-storey Colonial-style Park Hyatt is a haven of tranquility amongst the frenetic bustle of Indochina's largest city. Adjacent to the Opera House, the hotel has a homely ambiance, excellent accommodation and first-rate service. The stylish high-rise Sheraton Saigon, close to the Opera House, offers functional luxury, cordon bleu cuisine, and sweeping views across the city and the Saigon River. Once a famous hotel in Saigon during the war, the Caravelle's well-designed building facing the Opera House and the Saigon River is the choice of discerning travellers. A comparatively new hotel in Ho Chi Minh City, the well-appointed Legend faces the Saigon River, a short walk from Dong Khoi Street. The stately Renaissance overlooks the Saigon River - a popular Ho Chi Minh City hotel with our clients. Stylish high-rise modern building in the city centre. High-rise building in the city centre, close to the famous Ben Thanh Market. High-rise tower near Cholon (Chinatown), about a 15-minute drive from the tourist centre. An attractive international hotel halfway between the airport and Ho Chi Minh City centre. High-rise building in the heart of the city centre. New 25-storey hotel with 405 rooms in District 5 near Cholon (Chinatown) with a shopping mall and large conference centre on the lower floors. 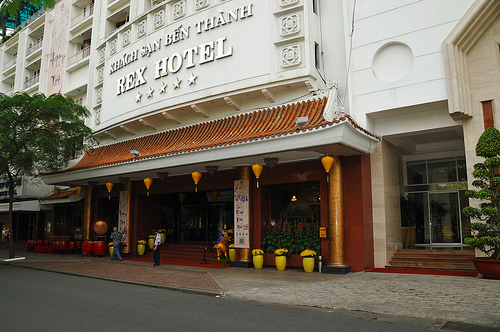 Unusual colonial architecture makes this famous hotel in Saigon a popular hotel in the heart of the tourist centre. Good all-round hotel, but it is more expensive than the average hotel in Ho Chi Minh City. Established in 1925, the Majestic Hotel is an attractively renovated French Colonial building facing the Saigon River on the corner of Dong Khoi Street. The building is old, but well maintained. A room with a pool view is highly recommended, as the alternative is rusty tin roofs. High-rise building near the airport, slightly further away from the city centre than other hotels, but the hotel runs a complimentary bus service to District 1 and taxis are available. Clean rooms and nice restaurants with good service. French Colonial style Saigon hotel used by American generals and reporters during the Vietnam war. It is a medium-rise building in the city centre, renovated in 2003. Close to Dong Khoi street, this high-rise city hotel is in the heart of the city. A very nice hotel 15 minutes from the airport. Overlooking a park near Ben Thanh Market, and close to the Reunification Palace, the Chancery is quite small, but has good service. Built in 1880, the Continental Hotel is a historical hotel sporting French colonial architecture. It is close to the Opera House and Dong Khoi street. However, it is a bit run down, and under-equipped. Medium-rise city hotel in the heart of the city centre. Good location, breakfast, and rooms, but service is below par. Pleasant medium-rise hotel near the city centre. A good hotel in general, featuring a swimming pool and a gym. Note: the service in the spa is bad.